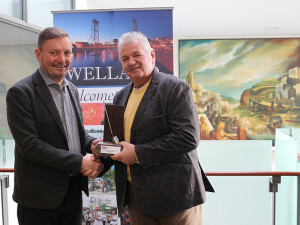 Mike Watt, Executive Vice-President of Walker Environmental presents Dan Degazio, Director of Economic Development, City of Welland with the shared Brownie Award. On Monday, Mike Watt, Executive Vice-President of Walker Environmental, presented a duplicate of Walker’s Brownie Award to the City of Welland. Dan Degazio, Director of Economic Development with the Corporation of the City of Welland, accepted the award. The Brownfield Network presented the original award to Walker Environmental in December, after their Atlas Landfill Remediation project was chosen as the winner of a Brownie Award in the reinvest category. The Brownies are given out each year to the top builders, innovators and visionaries that have revitalized communities across Canada with their brownfield rehabilitation projects. Out of 30 nominations, Walker Environmental walked away with one of ten awards handed out at the event. For Walker Environmental, the Brownie Award belongs just as much to the City of Welland as it does to Walker. After all, it was a private-public partnership with the City of Welland that allowed them to create this award-winning project. The two groups worked to implement a unique approach to manage the risks associated with an abandoned industrial landfill. Walker Environmental developed a model to remediate the site and brought it into compliance with modern standards. The site has since been re-opened as a depository for solid, non-hazardous contaminated soils from brownfield sites and other large developments. Upon closure, the site will be returned to the City of Welland to use as an area for public passive recreation use. Walker Environmental looks forward to continuing the positive relationship they have with the City of Welland throughout the remaining phases of this project, and long after the project is completed.